The first of three upper-intermediate ESL lesson plans on the theme of 'society'. It focuses on vocabulary and discussions around current social issues and includes a lead-in activity, several classroom exercises and a game. And don't forget, if you use an iOS or Android device, you can get offline access to these materials through the TEFL Handbook app. 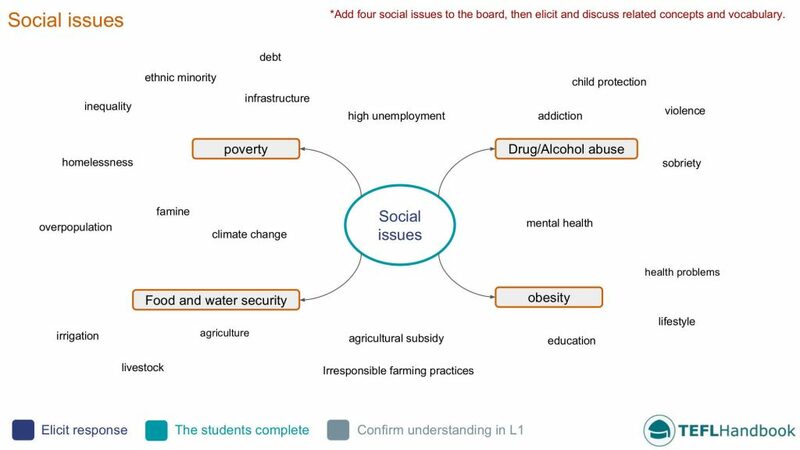 Start by eliciting or adding four social issues to the board. Then discuss concepts and vocabulary related to each one. Use this spider diagram as a guide. Discuss one of the social issues from the board as a group. Is it a problem in this country? What is its impact on society? Add any new ideas and vocabulary to the board. Following on from the previous activity, students will now work in groups of three to discuss the remaining social issues left on the board. When they have finished, have another group discussion on each issue. Again, add any new concepts and vocabulary to the board. The students will debate some controversial arguments related to issues in society. Organise this depending on the size of the class. One option would be to pair the students up, assign each student to one side of an argument, and have them present one at a time. For a larger class, you may want to divide it into two groups and have them work on a couple of issues. Give the students enough time to prepare their arguments. Five minutes if you've paired them up, ten minutes for two larger groups. You will chair the debates and make sure that everyone has had a chance to say their piece and respond to any counter-arguments. Make it more fun by picking a winner at the end of each debate, based on their performance. You should justify your choices. 1. Is animal testing a justified? 2. Are video games containing violence appropriate for children? 4. Torture is justified when used for national security. 5. Cigarettes should be banned. Players have to represent abstract concepts related to society on the board while their teammates guess what they are. Start by dividing the class into two teams. On each turn, give the student in play an abstract concept related to societal problems. That student must then represent it on the board using only images and symbols. Their teammates earn a point when they guess it correctly. To make it more competitive, split the board into three parts, set a stopwatch for two minutes and give the student with the marker three concepts to represent. The team with the best time wins. We hope that you found a few of these ideas useful. Our next free lesson in this series is on using conditionals. Also, be sure to bookmark our complete list of upper-intermediate level ESL lesson plans, as well as our entire collection of ESL courses.